Germany: Urgent Petition – Billi Has Had His Ear Bitten Off; Lets Get Him Moved To English Sanctuary Right Now. Please Sign the Petition. 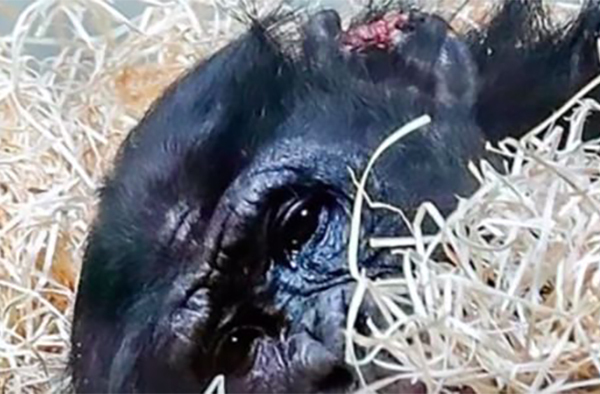 We recently did posts re Billi the Bonobo who is really suffering at Wuppertal zoo in Germany. He even had part of his ear bitten off by other primates who did not accept him. Billi with his bitten off ear. So he needs to be moved somewhere else; and quickly. This petition is pushing for Billi to be sent to ‘Monkey World’ in Dorset, England; where he will be looked after and given better protection. Please sign and speak up for Billi now – lets get him moved to the UK. EU: a parasitic garbage pile! Malaysia: Dog Caught by Chinese Steelworkers Hit With Hammer, Covered With Boiling Water and Then Disembowelled. Demand Action With This Petition.